While Gayle Lindsay, a former 400/800m was on holiday visiting her twin sister and churning out a victory in the process and Rebuen Stoby was continuing his winning ways, the Rotary Sunrise Club was putting the pedal to the metal to tie defending champions Rotary Club of Tortola, who hadn't lost a Service Clubs Cross Country race in the last 11 seasons of the Mourant Ozannes College Classic Series. 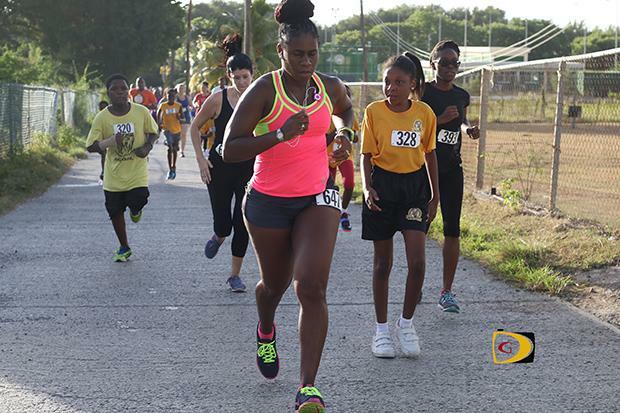 In pulling off the surprise performance, Rotary Sunrise, placed four of its runners in the top six, to score 38 points and tied the Rotary Club of Tortola who also had 38. "One of the most exciting part of the race was in two particular areas-the One Mile Division and the Service Clubs Cross Country division," noted race director Stephanie Russ Penn. "Sam Potgieter continues do dominate the event running a tremendous mile in 6 minutes and 34.2 seconds, improving on the 6:42.2 he ran in the first race. Then, something we haven't seen before, the Rotary Club Sunrise pushing the Rotary Club of Tortola. They came out really strong this race No. 2 and that added a little fire to that category, because it's up in the air as to who will be the overall champion as they are now closer then they've even been with the Rotary Club of Tortola leading by one. So, I'm excited to see what will happen next and looking forward to the season as it progresses." In the 2 Miles race, Lindsay ran a time of 13 minutes and 38.50 seconds as the fastest woman and placed fifth overall of all the 175 entrants in the segment. "I don't think I've run two miles before but I can run a mile under six minutes," Lindsay said. "It was a good race and the course was nice-a nice downhill on the way back. It was nice to have a good turnout with all the kids and different age groups. A nice race." Overall winner and defending champ Stoby was first across the line in 11:28.56. "I was hoping to chase the record but I had a really poor start, didn't get to start my watch properly, several persons were in front of me and it took a while to really get into my stride so that sort of affected me," Stoby explained, noting that he'll have to get out faster next time. "I try not to go too hard because I still have to worry about the hill, so I don't want to got that route, but, apparently, I'll have to do that just to get away from the bunch." TWO MILE: Open Men: 1. Reuben Stoby, 11:28.56. 2. Julius Farley, 12:09.86. 3. Samuel Romney, 12:10.35. 4. Zebalon McLean, 13:26.82. 5. Adrian Dale, 14:02.17. 6. Patrick Ormond, 14:27.61. 7. Reu Rhymer, 14:36.63. 8. Claudius Rhymer, 14:38.23. 9. Donald Stone, 14:56.55. 10. Luka Chalwell, 15:17.92. 11. Jayden Augustine, 15:48.46. 12. Wanyae Belle, 15:50.90. 13. Chris Potgieter, 15:54.88. 14. Alric Smith, 15:56.89. 15. Chad Willock, 16:16.36. 16. Jerry Thomas, 16:28.74. 17. Elvette Dore Sr., 17:15.28. 18. Greg Romney, 17:34.83. 19. John Cullimore, 18:08.37. 20. Aaron Harry, 18:32.63. 21. Howard Moore, 19:32.22. 22. Jim Cullimore, 20:28.50. 23. Owen Graham, 20:53.92. 24. Bill Kinkead, 22:08.06. 25. Michael Fay, 23:47.07. 26. Barry Leon, 23:47.50. 27. Matai Frett, 28:24.28. Open Females: 1. Gayle Lindsay, 13:38.50. 2. Claire Banks, 14:46.08. 3. Katrina Lindsay, 14:47.43. 4. Gillian Plaxton, 15:09.43. 5. Kay Reddy, 16:25.18. 6. Philomena Robertson, 17:12.18. 7. Jahtivya Williams, 17:33.52. 8. Zoe Bickerton, 18:09.05. 9. Sarah Duncan, 18:17.93. 10. Angela Burnett-Penn, 18:41.72. 11. Laura Dore, 19:49.69. 12. Debbie Dagou, 19:57.34. 13. Clair Burke, 20:09.18. 14. Rosa Alderto, 20:59.99. 15. Claire Santillan, 21:24.74. 16. Akeela McMaster, 21:27.25. 17. Amy Quayle, 21:33.28. 18. Lynelle Gumbs, 22:24.95. 19. Shirley Liburd, 22:29.35. 20. Khiayah Doward, 23:26.13. 21. Abriel Magloire, 23:34.47. 22. Michelle Dennis, 24:15.06. 23. Sophie Dabbs, 24:51.32. 24. Denise Frett, 30:04.72. 25. Lee-Ann Hall, 33:00.61. 26. Jennifer Thomas, 33:31.62. Primary Schools Teams: Cedar School Primary (CS), Francis Lettsome Primary (FLPS), Joyce Samuel Primary (JSPS), Pelican Gate (PG), Willard Wheatley (WWPS) 1. M'khori Crabbe (JSPS), 17:08.99. 2. Jahshani Farrington (FLPS), 17:22.99. 3. Kianjah Roberts (JSPS), 20:43.90. 4. Makeda Gumbs (JSPS), 20:44.10. 5. Jesse Cockburn (JSPS), 20:46.18. 6. Jahnare Farrington (FLPS), 21:30.96. 7. Jessimee Estridge (FLPS), 22:18.91. 8. Kavon Wheatley (FLPS), 22:48.09. 9. Jahmarley Frett (WWPS), 22:48.36. 10. Rickie Haywood (FLPS), 22:58.54. 11. Jayden Fahie (JSPS), 23:06.73. 12. Angel Beato (JSPS), 23:24.67. 13. Cheyanne Castello (FLPS), 24:22.07. 14. Anica Penn (JSPS), 25:17.28. 15. Shinique Robin (JSPS), 27:01.90. 16. Sanjay Henry (JSPS), 27:20.15. 17. Kjornni Daniel (JSPS), 27:31.03. 18. Litzy Beato (JSPS), 27:31.24. 19. Alexander Frett (WWPS), 30:55.66. Points: 1. Joyce Samuel Primary Team 1, 19. 2. Francis Lettsome, 33. 3. Joyce Samuel Primary Team 2, 65. 4. Willard Wheatley, 25 (2 participants). Points: 1. Cedar School PTA Team-1, 43. 2. Joyce Samuel PTA, 95. 3. HLSCC, 48 (4 participants), 4. Digicel, 64 (4 participants). 5. Montessori PTA, 28 (3 participant). 6. Pelican Gate PTA, 39 (2 participants). For more information about the race series, please contact Mrs. Russ Penn, 852-7216.